Last we looked at the national polling, it was effectively a three way tie in the Republican race, with Rick Perry bringing up the rear. 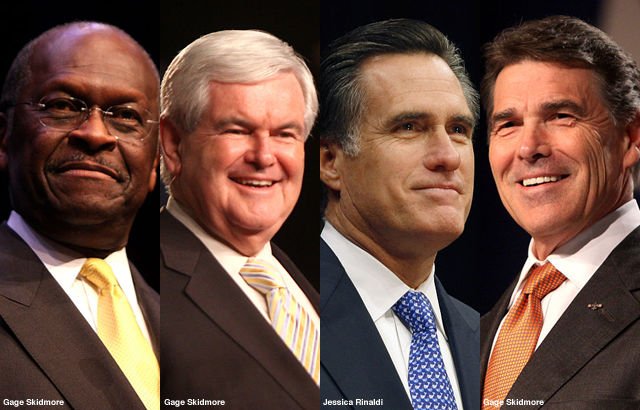 Now it looks like as this week has gone on, Newt Gingrich has continued to rise at Herman Cain’s expense. The newest poll is from Anderson Robbins Research and Shaw & Company Research for Fox News. 370 Republican primary voters, MoE 5. Mobile and landline handling included. Three candidates in double figures: Newt Gingrich just barely leading at 23, Mitt Romney right behind him at 22, and Herman Cain a noteworthy distance back at 15. Rick Perry in this poll falls back to single digits at 7, below the Pauldoza line. No direct favorability questioned are asked for individual candidates in the poll, which is the metric I’m using to know when Gingrich’s numbers are “real.” So for now, I’m left to imagine Gingrich is still riding high, just as Perry and Cain each were before they took their leads and drew attention both from the opposition and the press. Dumb question of the day award goes to the pointless question asking who would win a third term: Bill Clinton or George W. Bush. It was dumb when they asked that match up in 1999, before Bush was first elected, and it’s dumb now after Bush has served two terms. We have important elections coming up and we’re wasting time with alternate realities? Seriously?